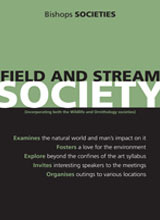 The Field and Stream Society was initially created to cultivate an enjoyment and appreciation of fly-fishing. However, the society has evolved to include several outdoor pursuits; this following the absorption of the Wildlife and Ornithology Societies, which has shifted the focus more to nature. The society enjoys various excursions into the spectacular surrounds of the Cape, and sometimes even further afield. The next meeting is the 5th February in B2 starting at 19h30. Next activitity is caly pigeon shooting. The society has organised many trips, including excursions to the White Rhino trail and many for fly-fishing. The Field and Stream Society meets once a term – boys are encouraged to look at the Pink Notice in order to obtain detailed meeting times.